Fully seasoned, fumigated & ready for your next project! Will gladly accept your stain or weather protectant. 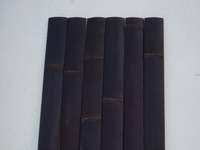 Bamboo slats are commonly used for wall coverings, bars, ceilings, wainscoatings & so much more!